Communities across the United Kingdom are marking the First World War centenary through numerous projects thanks to funding from the Heritage Lottery Fund (HLF). Members of the public have been encouraged to come forward with stories which have not previously been shared publicly, and to reflect on the events of the Great War, and the experiences of men and women, at home and overseas. These projects are part of a ‘national commemoration’ which the Department for Culture, Media and Sport is leading on - find out more here. A great example of one such project is a compelling exhibition which is currently showcased at Kingston Museum, entitled ‘1914: Remembering Kingston at War’. Lucy Harris, the Project Leader, tells us more. 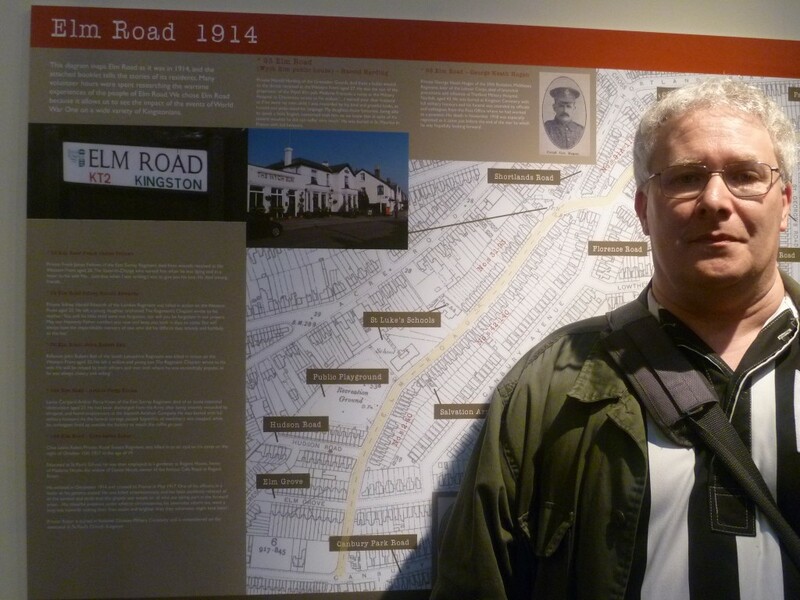 Volunteer Dan Leissner with his Elm Road project - © Kingston Museum and Heritage Service. Research for the exhibition was undertaken at the beginning of the year by a 15 strong team of volunteers, who gave an inordinate amount of hours to the project and uncovered many interesting stories, all of which will be stored in a specially created archive, which will be accessible to the public via the Local History Room. The exhibition covers eight key themes. It begins with the history of Life on the Home Front focusing on the stories of the inhabitants of Elm Road, a prominent location in Kingston. This focus enabled us to provide an in depth analysis of a cross section of society which in turn gave us an idea of the effect of the war on Kingston as a whole. The next section concentrates on Conscientious Objection and Recruitment following the case of Conscientious Objector, Albert Leverson James, who died in prison. Kingston’s Call to Arms Recruiting film is shown before visitors are immediately confronted by the realities of front line warfare in our interactive trench exhibit. Upon passing through the trench, visitors reach a section focusing on Under age and Over age soldiers, telling the tale of Sidney Lewis, the youngest combatant to sign up during the First World War (at age 12), who enrolled in Kingston. Opposite this section, and in juxtaposition with its grimness, is the tale of two Kingston nurses who fell in love with the soldiers they were caring for at Kenry House and Kingston, Surbiton and District Red Cross Hospital. The largest, most open area of the exhibition room is dedicated to War Heroes and the Roll of Honour. Kingston is very lucky to have a comprehensive Roll of Honour detailing the lives of 628 men and one woman, who died fighting and serving for the war effort. The Roll of Honour is on display in the exhibition but is normally stored at the Local History Room, where it is available to view, along with 200 photographs of some of the men listed within. These photographs have been digitised and are on view in the exhibition. 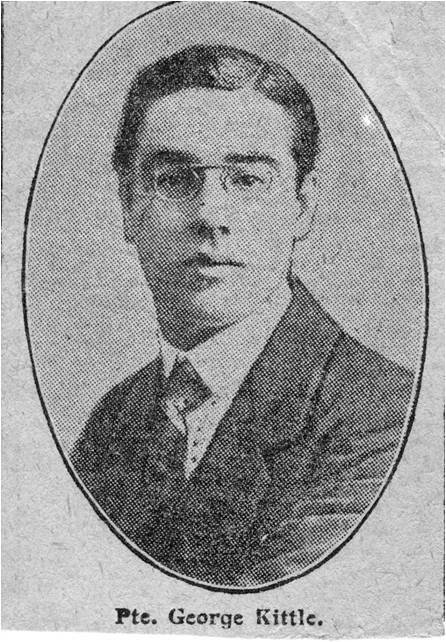 George Kittle - © Surrey Comet and Kingston Museum and Heritage Service. Also in this area is a wall concentrating on War Work and specifically the stories of Annetta Ellen (Netta) Broad and George Kittle, who both appear on the Roll of Honour and who both unfortunately died while involved in war work. If you looked up to the ceiling from this point in the exhibition, you would see two model planes, one of a Sopwith Pup and one of a Sopwith Tabloid. The exhibition hosts a significant section detailing Kingston’s roll in aviation history, with the establishment of Tommy Sopwith’s Aviation Company in Canbury Park Road in 1912-1914. The final section in the exhibition focuses on the Belgian Refugee community, in particular the lives of two Belgian refugee artists, Jan de Clerck and Oscar de Clerck, who escaped to Britain in a fishing boat. We were lucky enough to receive many loans from the public for display during the exhibition and also some objects from national museums. For example, the Victoria and Albert Museum loaned us the exhibition catalogue of The Belgian Exhibition of Modern Art held at Kingston Art Gallery in 1915. From the public we were loaned letters, postcards, a nursing uniform from the Queen Alexandra’s Imperial Nursing Reserve and a First World War tin hat or ‘Brodie’ helmet, to name but a few items. The exhibition opened to great acclaim, with the private view on Thursday 15th May. The Mayor and Mayoress of Kingston were present and speeches were made by the Mayor, by Lucy Harris, Project Leader, by Jill Lamb, Heritage Team Leader and Borough Archivist and by Charlotte Samuels, Museum Curator. Over forty guests attended the private view and all were full of congratulations for a successful exhibition. Family Launch Day at Kingston Museum - © Kingston Museum and Heritage Service. Following swiftly on from the private view was the Family Launch of the exhibition on Saturday 17th May. 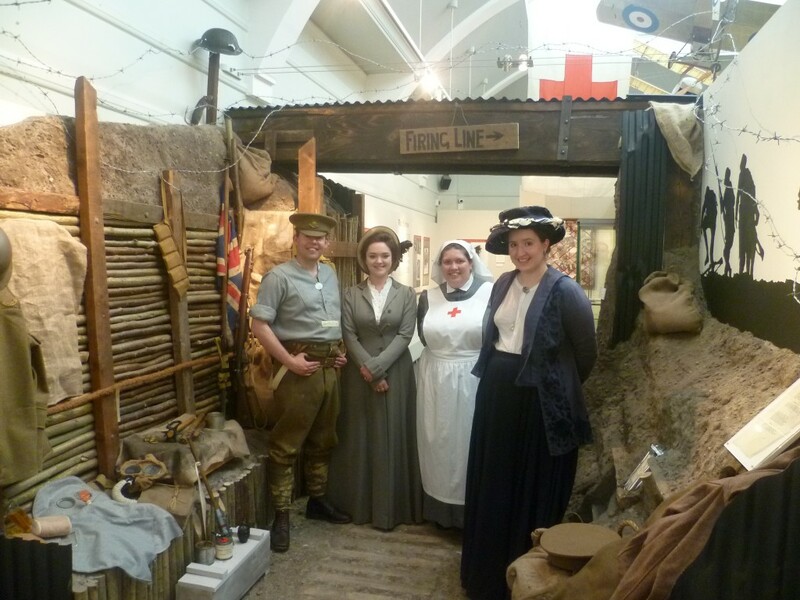 The museum welcomed families into the First World War exhibition with re-enactors dressed as a VAD nurse and Tommy; there was also a middle class Edwardian lady and a Sopwith’s factory worker welcoming our visitors. Children were able to dress up as a soldier and ply the Tommy and nurse with questions. There were trench objects and nursing apparatus to handle and craft activities were planned. It was a great day out for the family. At the moment we are busy creating further learning resources and teachers’ packs to complement the exhibition. We are also in the process of establishing a ‘1914: Remembering Kingston at War’ archive for which we will readily accept donations or loans which we can then digitise. We wish to thank everyone involved in creating such a superb exhibition, which is open until 16th August.